Steffon Armitage, right, has agreed a new deal with Toulon. 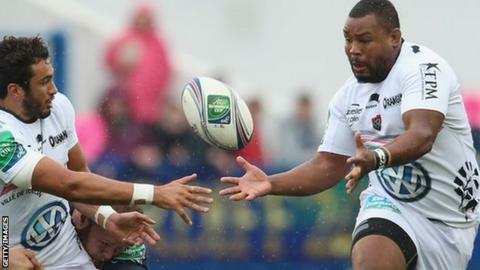 England flanker Steffon Armitage has signed a three-year contract extension with Heineken Cup holders Toulon. Armitage joined the French Top 14 club from London Irish in 2011. The 28-year-old told Toulon's official website: "I've been here three years now and good things have happened. "We've won the European Cup, we've reached two quarter-finals in two years. I hope we continue and win the Top 14 this time." Armitage has made five Test appearances for England but has not been capped since the 2010 RBS Six Nations tournament. He made his full England debut against Italy in 2009 under former manager Martin Johnson. Armitage moved to France to play alongside his brother, Delon, a full-back.